Heavy-duty HVAC packaged systems can be a great option for you if you don’t have room indoors for the interior component of a split-system air conditioner or heat pump. Gibson offers packaged options that provide powerful heating and cooling capabilities without breaking the bank. Whether you are looking for a gas/electric packaged unit or simply a packaged heat pump or air conditioner, there is a Gibson system for you. Each dependable unit is backed with the 10-Year Limited All-Parts Warranty in addition to the limited lifetime warranty for the heat exchanger – when you register your HVAC packaged system. Each HVAC packaged system is protected with a plastic mesh engineered to protect the coil against many manners of flying debris – like balls or hail. Knowing that your budget-friendly unit is designed to last can provide long-lasting peace of mind and confidence in the system you are purchasing.All Gibson gas/electric packaged units feature the SmartLite®control board, which programs the ignitor to adapt to the furnace’s heat-up characteristics – extending ignitor life. Ease of installation is generally equated with HVAC packaged systems available in a small footprint. In addtion to the durability and performance that comes with this 14-SEER unit, it will be easier for your contractor to install. Because packaged systems contain both the indoor and outdoor component of an air conditioner or heat pump, they can get rather large. With a small footprint packaged system, your contractor can install the unit right next to your home. For installation flexibility, choose a large footprint 14-SEER packaged air conditioner or heat pump. These powerful units are long-lasting and can be installed on a slab or roof. In addition, your contractor will have easy access to its interior if a repair ever needs to be made through convenient service access panels. They also include heavy-gauge, full-perimeter base rails for easy mounting and handling. 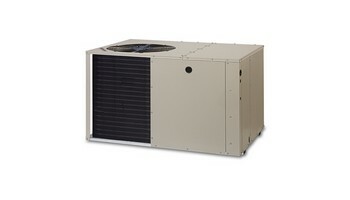 Plus, a 14-SEER system can be a great upgrade from an older air conditioner or heat pump that may only be 8 or 10 SEER. If you live in a cooler climate but need your heating and cooling components in a convenient packaged system setup, explore the benefits of a quality Gibson gas pack. These all-in-one heating and cooling systems contain the components of a furnace and air conditioner in one convenient package. These systems can be paired with indoor air quality system features that aid in whole home comfort and total satisfaction. Your designated Gibson contractor can set you up with the ideal, hardworking gas/electric HVAC packaged system.They can let you know whether your home would be better suited for an HVAC packaged system and whether you need the additional heating powers provided by a gas/electric packaged unit.